Hospitality in Indonesia is not an empty word. 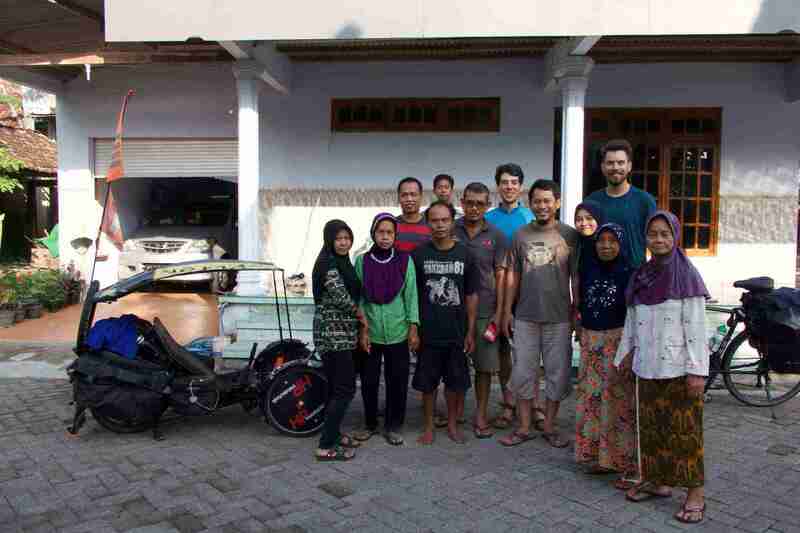 Indeed, we received so much help from people we met in Indonesia during our bike trip with my brother in April 2018 that I felt the need to write something about it. First, I would like to keep track of this experience and at the same time thank all our Indonesian friends who helped us on the way, making this experience unforgettable. I would also like to try to understand such hospitality and even implement some of it into my life to be a better person, to share it with others and maybe spread this good spirit in Switzerland ! Firstly, a huge thank you to Radit from Yogyakarta ! Thank you for hosting us in Yogya for 2 days when we arrived. You helped us recover from the challenge of travelling by plane with bikes. 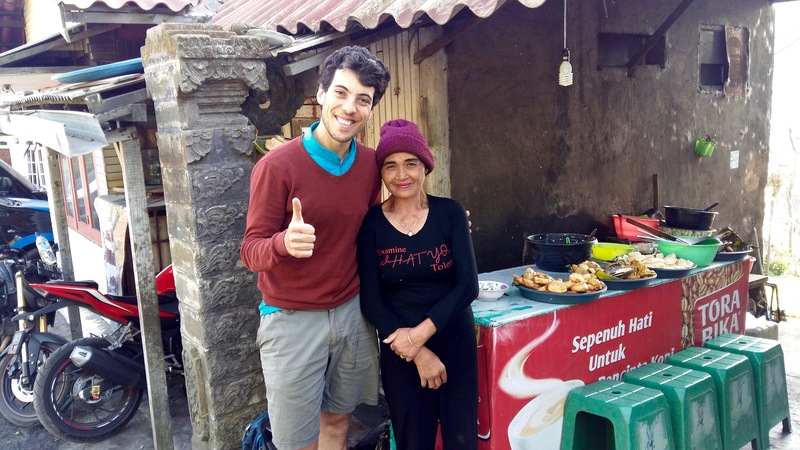 Thank you so much for your advice, your tips on local food and your friendly contacts that helped us up to Malang, thus forming a chain of friends of nearly 500 km ! You are a great person and I hope you can continue to live the way you do and fulfil your alternative dreams, goals and housing projects. Secondly, a big thanks to the families that hosted us for several nights along the trip. My brother and I were complete strangers and sometimes had communication problems ; we arrived out of nowhere in small villages, sometimes at night, etc. but in few minutes you invited us to share drinks and food, you always found solutions to make us feel comfortable and let us sleep near your house (sometimes even on your patios !). Thank you all for that. Thirdly, thank you so much to Dhamat and your colleagues from the Kediri region ! You invited us during your working day to share delicious pastries and iced coconut drinks. Then you invited us into your office, which is the Kediri’s police station ! You finally arranged everything with your colleagues and boss to let us sleep there. Let’s not forget that you even asked the security guard to bring us food for the next two meals. Thank you for such a treat and the time you took for us, you are definitely a generous person. Fourthly, an enormous thank you to all the cycling community of Blitar, in particular Pablo and Ovan (“the leader”). Beyond hosting us for the night, you took the time to introduce us to the famous STMJ drink (based on tea, milk, egg and ginger !) and to give us a guided tour of Blitar with the amazing mausoleum of Sukarno. the following day, the short journey together as a cycling band of brothers was also an unforgettable moment of the trip. 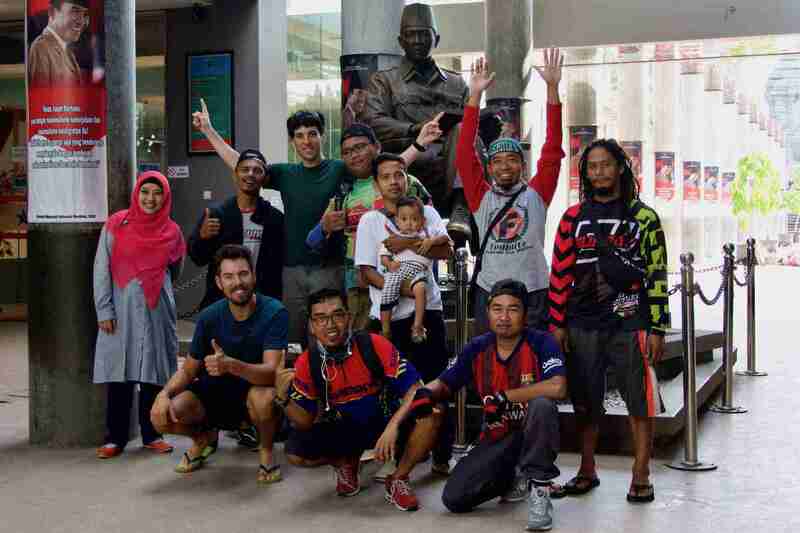 You are all great people and keep biking culture alive and well in Indonesia ! Chapeau Messieurs (= Congrats Sirs) ! Fifthly, a gigantic thank you to everybody who helped us in Malang, in particular Rizky, Zuyyin and Henri. In addition to offering us shelter for the night, you also helped us find a pick-up for our bikes to go to the world renowned volcano region : Bromo-Tennger- Semuru national Park ! You even came with us in the pick-up under the beating sun… wow ! You are all wonderful and I hope you can continue to expand the bicycle culture in Malang, especially for women ! Finally, lots of thanks for all the persons along the road who were curious and interacted with us, who offered us drinks, coconuts, extra fried dishes or desserts, who played volleyball with us or simply said hello and smiled to us during these days etc. These shorter moments have always lit up our cycling days and made us stronger to continue to ride ! After these (very!) long thank yous, a question remains : why so many acts of hospitality ? This was very often the only way to give something back and it was also an opportunity to share that we’ll keep in our memory. This is also due to a local’s curiosity for foreigners. “Where are you from ?! ?” is by far the first question we asked (or shouted ! ), even when we rode ! A lot of people, in particular the younger generation, are also curious and want to know what we think of Indonesia and its inhabitants. 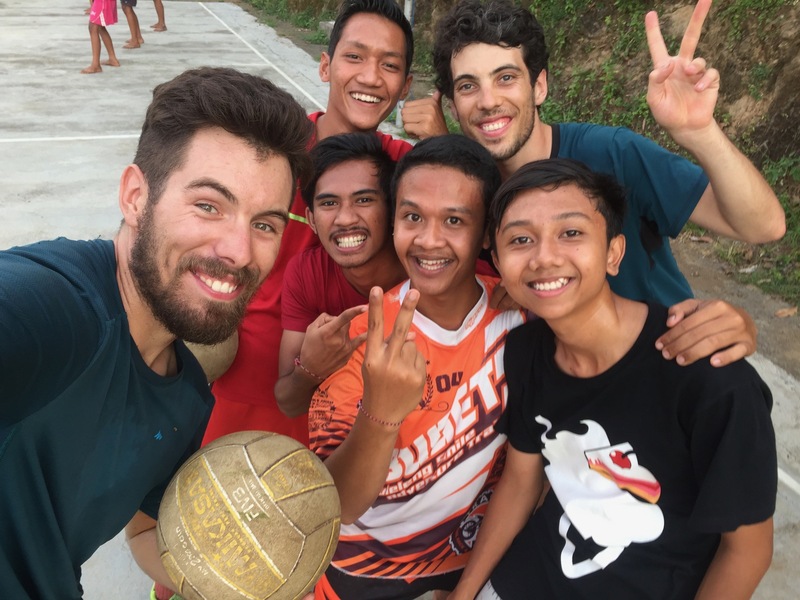 I always have the same answer : Indonesia is beautiful and Indonesians are always smiling to us and usually very friendly and generous people ! There are different answers. These are usually positive, but similarly to our Western countries, their media seems happy to share mostly negative events about Europe. The terrorist attacks in Europe have sometimes cooled down their intentions to visit Europe whilst some anti-muslims events and declarations have also chipped their initial vision of tolerance in Europe. I regret this fact that seems to spread fears between people by exaggerating or constructing bias ! My biking trips remind me of a simple truth : 99% people are kind and all our efforts should be to build trust between people. So again, why so much hospitality ? It is more than only taking selfies or the curiosity. 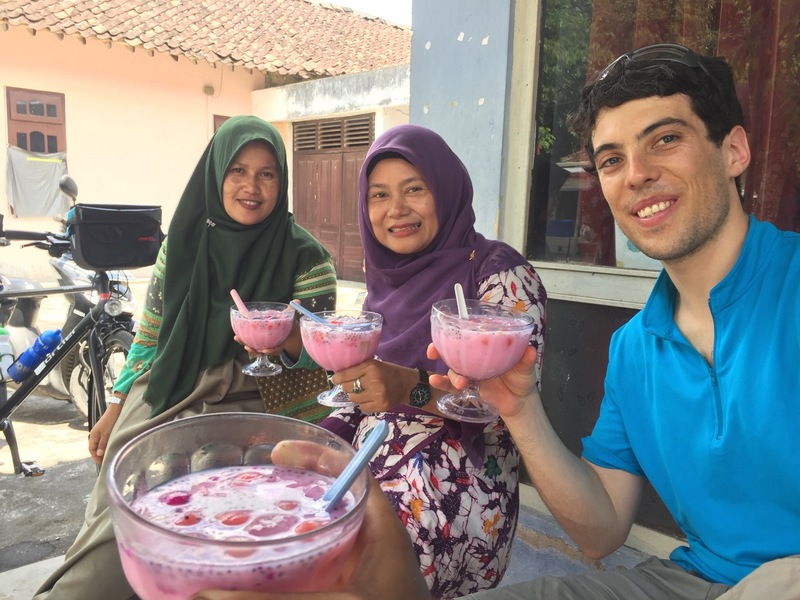 I can testify that there is a strong culture of hospitality in Indonesia for travellers and foreigners. Even if I think it is strongly influenced by the Muslim and Hindu traditions which are strong in Indonesia and Bali, it goes beyond that as it is largely spread amongst different people with different types of beliefs. In conclusion, I admire this welcoming attitude and hope it can continue to flourish. Not only in Indonesia but also in Switzerland ! In the way some media report the news, I sometimes regret mistrust between people from different nationalities in my home country. I can only hope that through this testimony, I will give you the desire to explore Indonesia and interact with its inhabitants. And also help to spread this trust and hospitality around us ! And you, others travellers and world citizens : Have you ever experienced such feelings and experiences ? And if so, where ?